It's been a long time since I shared a teaser with you all, so I thought I'd post one from Rhapsodic, which is coming out fall of this year! Not going to lie, I sorta just closed my eyes and stopped on a random page, but I stumbled upon a good scene, so it all worked out for the best. :) It was supposed to be mini ... but I gots carried away! Enjoy! The Bargainer blocks my exit, his hands gripping the top of the doorframe. Unwillingly, my eyes move to those toned arms of his. I didn’t actually think he would try to keep me here. He’s wanted nothing to do with me for so long that I can’t really imagine our relationship any other way. I back up, suddenly nervous at the look in his eyes. In the next instant, he’s on me, his hands roughly cupping my cheeks. His mouth crashes into mine, his lips demanding. Des is kissing me, and God is it savage. I kiss him back without thinking, swept up into the taste of him and the feel of him holding me. I’m supposed to be leaving, reclaiming my house and my life, but nope. It’s not going to happen, not while Des is demonstrating all the ways my taste in men was spot on when I was a teenager. I’m backing up, and one of the Bargainer’s hands has dropped to my thigh, exposed by the high slits of my dress. His fingers move up and down the skin, up and down. My back bumps into the wall. Des cages me in, holding me hostage with his body. My lips part, and Des’s tongue sweeps inside my mouth, claiming mine. His hand moves to my breast, and I arch into him, my breath leaving me. “Gods, Callie ...” he rasps. Des’s wings materialize, spreading out and closing over the wall around me. While I kiss him, I begin to run my fingertips over them. He groans, leaning into my touch. Gueeessss what?! Rhapsodic, my upcoming NA paranormal romance trilogy finally has it's official description! I'm so excited to share this novel with you. It's been over two years in the making, and it stars a fae king and the siren who's indebted to him. Everyone knows that if you need a favor, you go to the Bargainer to make it happen. He’s a man who can get you anything you want … at a price. And everyone knows that sooner or later he always collects. 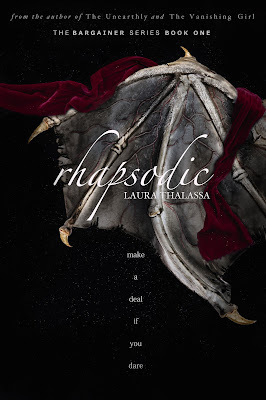 If you enjoyed that, click here to add Rhapsodic to your Goodreads "To Read" list. If you'd like an email notification on the day it releases, make sure to sign up for my newsletter, here.